The NHL deadline is fast approaching, and teams are trying to figure out whether they are buyers, sellers, or just staying put. Deadlines can help a team out and move them further ahead in rebuilds then ever before planned. They can also really cost teams that go all in, and don’t end up winning it all. I am here today to share my argument on why the Leafs shouldn’t buy this deadline. Now, before I get into it I should say my official stance on the issue. While I don’t think the Leafs should buy, I also don’t think they should sell either. You will see why I don’t think they should buy, and I will also try and touch on why they shouldn’t sell. There are maybe one or two players I’d look at selling to give rookies a shot, Leo Komarov being one of them. However, there is no need to go fire sale on all UFAs. So with that being said, let’s look at why I think they should stay put. This is the main part for me personally. The two teams in front of the Leafs in the Atlantic Division; the Boston Bruins and Tampa Bay Lightning. Everyone knows how good Tampa is, a favourite by many to come out of the East since the start of the season, they are currently on pace for 117 points. However, there are also the Boston Bruins, who seemed to have quietly become another favourite. They are on pace for 112 points, just 5 less than Tampa, and haven’t lost in regulation in 14 games. These two teams have the best chance of winning the cup according to Money Puck. So obviously having these teams in the league is a problem in general, but there are dominant favourites like this every year. What really makes this so special the Leafs shouldn’t buy? Well the Leafs will have to go through both of these teams in the first 2 rounds. It is most likely they will see Boston first, but it is possible it is Tampa. Either way, the Leafs will have to face one cup favourite in one round, and then a 2nd cup favourite in the next. This is just too much for the Leafs to go through realistically, and makes me think it’s not their year. The Leafs don’t match up well enough with either of these teams, especially the way they have been playing lately. If it was just one true giant you have to deal with before the finals you could convince yourself to stack up and hope “Anything can happen”. Asking for that kind of thing to happen twice however seems bold. This isn’t even including who they’d face in the ECF or SCF because I don’t see them coming close to that. Now, I can already hear what some Leaf fans will be screaming. “What do you mean we can’t beat Boston? We’ve beat them 6 times in a row!” While this is fair, and good on the Leafs. The Bruins team that lost even their back to back earlier this year on November 10th and 11th is a very different team. For the first 2 months of the season Boston was crippled with injuries, and was never truly healthy. Last season they were nowhere near as good as this season. They lacked the rookies that they have this year that has given them not only scoring depth, but also a key blue liner in Charlie McAvoy. This Bruins team is a total different team from even earlier this season. The Bruins haven’t lost in regulation in 14 games, and are 14-1-4 in their last 19. They are 3rd in 5v5 shot attempts, where the leafs are 17th. The Bruins are also 5th in xGF%, where Toronto is 14th. This is an overall better Bruins team that the Leafs will struggle to deal with. I’m not sure how much I even need to touch on this one, but I will anyways. Even if the Leafs manage to get past Boston, they still have the best team in the NHL in Tampa to go through. Personally, I don’t see how these guy match up well at all. Frederik Andersen has been great this season, but he is still no match for a Vezina candidate like Andrei Vasilevskiy. As for D corps, Tampa blows Toronto’s away. 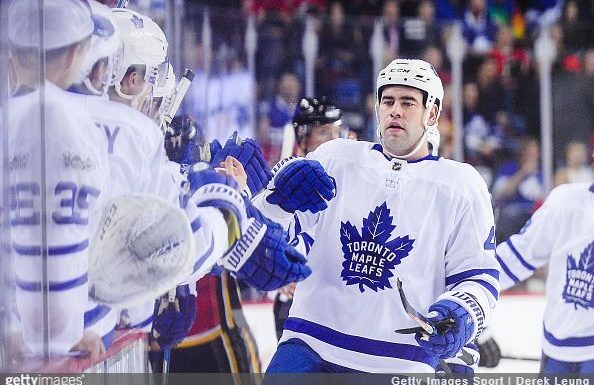 The Leafs are mediocre enough, playing Roman Polak doesn’t help either. The Bolts on the other hand have a possible Norris Candidate in Victor Hedman, who is amazing. They also have a possible Calder candidate in Mikhail Sergachev who has also been great. Throw in an Anton Stralman and that’s an elite looking blue line. If you look at forwards, I think this is where the Leafs at least get close to matching up. Saying that though, the Leafs “Insane forward depth” feels like it is still overrated. They are probably closer to 7th or 8th in the league, instead of 1st or 2nd like some still seem to believe. They could at least come close to matching Tampa, depth wise they may have a very slight edge. It is nowhere near enough to counter the D or goaltending difference though. If they somehow managed to claw through Boston, it feels VERY optimistic to suggest they can also beat an elite Tampa team. The answer to the above paragraph’s problem would be to add at the deadline. Now the problem with that is the Leafs would have to add way too much to make it make sense. Bare minimum if they want to even have a 50% chance at beating Boston and Tampa they would need to add a top 4 D, and at least a 4C. The 4C may be cheap, they got Brian Boyle last deadline for a 2nd, which was a solid pickup. They would need to add someone like that again this year. Their 4C has been a revolving door, and frankly none of them have been good enough to be a contender. They would most likely have to give up a 2nd round pick, or a 3rd or 4th tier prospect. Obviously this isn’t brutal, and would be totally fine if it was all they had to do. However, it is not. If the Leafs seriously want to be considered a contender or have a chance to beat the 2 big teams, they are going to have to add a legit top 4 Dman. The minimum would be a guy like Mike Green, and I’m not even positive he’s good enough. They need a guy who can play 20+ big minutes a night. These types of players are NOT cheap to begin with. They will be even more expensive at the deadline. They’d likely have to give up a first, and a solid prospect or two. Or a legit roster player or two (Like a JVR+Brown+Pick type thing). Depending on the player even this may not do it. It all just feels like something that should be tackled in the offseason, not this deadline where prices will be jacked up. I’m usually the “If you’re not a complete cup favourite you should think about selling” type of guy. In this case however, I think it may be smart for the Leafs to stay neutral. I say this because, let’s say the 2nd last week of the season the Bruins lose Begeron, Pasternak, and Backes all to injury. It is very unlikely, but could happen. Suddenly if you’re the Leafs and you just sold all UFAs, you may not be able to beat them anyways. You keep this team you currently have and you give yourself a shot. Who knows what happens from there? It’s a very unlikely thing, and the Leafs shouldn’t count on it happening, but it could. Staying neutral doesn’t hurt your future, but also keeps possibilities open. If you’re the Leafs you should just hang tight. If you want to make one or two real small depth moves you could, but bringing rookies up would probably be more effective. This isn’t the year that is right for the Leafs, and staying put may help their future. They are in no danger of missing playoffs, because LOL Atlantic, but they also are in no position to call themselves favourites. If I’m the Leafs, I stay with this team, see what happens, and change in the offseason. If you bring in a T4 D, the offseason would be the time to do that, not the deadline where people are known to completely overpay. This team can stay put, give a fight to the Bruins, and make themselves better to go for a run next season. It would take almost a collapse unheard of to miss the playoffs, but going for a run should not be what the Leafs expect this season. Due to the talent they have to face, and the overall price it would cost to make their team even close to Boston and Tampa, the Leafs would be smart to just sit pat. This is why the Leafs should not be buyers this deadline. Previous Post: Trade Deadline: So You’re Saying There’s a Chance?